New Wonder Woman Will Wear "Those Little Shorts"
NBC surprised the world today with the announcement of a third, never-before-seen Wonder Woman costume that will feature - because you demanded it - "little shorts." It's utterly baffling to me but for some reason, a lot of people seem really wound up about the costume Adrienne Palicki will wear in the new Wonder Woman pilot being developed for NBC. Shiny blue pants? And matching blue boots? Unacceptable! So changes were made: the vinyl pants were dropped, replaced by something a little more functional-looking (and a little less reflective) while the boots went from blue to a more wonderful, womanly red. Power to the people! Except according to NBC President Robert Greenblatt, that was the plan from the start, and there's actually a third, as-yet-unrevealed costume that will make old-time Wonder Woman fans very happy. 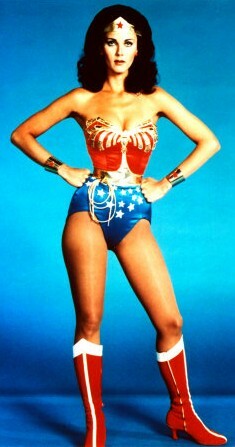 "There was an initial outcry about the long pants - you know, skintight pants as opposed to those little shorts [worn by Lynda Carter in the original TV series]," Greenblatt told TVLine.com. "But the shorts were always planned. They are actually used in the final confrontation when she beats Veronica Cale." "We haven't made any changes from what was planned," he said. "But it's always good to hear the feedback. I'd rather have people really passionately engaged in conversation, even if they hate something, than be kind of bored." He added, however, that limits must be set and that further changes in response to fan criticism are unlikely. "There's always critiques of everything," he said. "If we listen to all of that, we would probably never be able to get the job done. David [Kelley] is a great writer... I think it's going to be interesting to see it cut together. I've been doing this long enough to know that nothing is a safe bet. Even with the best of intentions and the best people, you just don't know until you see it finished - and we're a few weeks away from that. But it's been getting a lot of attention. A lot." Now that the big news is out, we'll probably see "Classic Shorts Wonder Woman" publicity photos fairly soon, but in the meantime I guess we can all finally breathe a little easier knowing that we really dodged a bullet, and that there will in fact be little shorts. Whew!